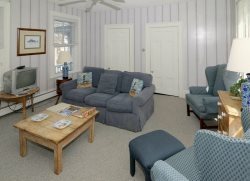 Treat your group to a captain's view of the Atlantic Ocean and Sesachacha Pond at SeaWatch, an exceptional vacation rental at the edge of the ocean complete with beach access and a separate guest house. Inside this 4-bedroom, 5-bath rental, find country classic décor that defines seaside summers, with a country-inspired kitchen, a farmhouse dining table, and an open-concept layout for easy socializing. Outdoors, rose and hydrangea gardens perfume the air and set the stage for evening barbecues on the grill. Once your burgers are seared to perfection, dine al fresco on the sun-washed deck with its table for 8. With two levels of living space—and two living areas—this home presents the perfect balance of togetherness and privacy for a group getaway. Downstairs on the open-concept main level, chat over afternoon snacks at the dining table, take a nap on the plush sofa, or settle into one of two crisp white armchairs to catch up. An old grand wood-burning fireplace commands attention at the center of this space. Upstairs, a second living area features panoramic ocean views and more plush, nap-worthy furniture. Settle into the chaise lounge and watch the flat screen TV, or choose a book from the homeowner's collection. Mix a cocktail at the wet bar, then step outside to feel the sea breeze from the second-level's oceanfront deck over the dunes. The classic kitchen at the heart of SeaWatch is equally perfect for both pancake breakfasts and gourmet dinners. Well-stocked with cookware and dishes, you can cook like you're at home here. White cabinets, blue marble counters, and a farmhouse-style sink recall French countryside kitchens, and a butcher-block island adds extra prep space and provides the perfect spot for chatting with the chef over a bottle of wine. Carefully prepared feasts can be enjoyed one of two places: indoors, at a farmhouse-style table illuminated by a classic chandelier, or outdoors on the patio, with an 8-person al fresco table in the sun. Guests can choose between three bedroom suites and a separate guest house, all with their own private bathrooms. On the downstairs level of the main house, you'll find two guest suites—one with a queen-size bed and one with two twins. Both have their own attached bathrooms. On the upstairs level at the main house is a stunning master suite with views of the ocean and pond. Sink into a plush, four-poster king-size bed and wake to the glimmer of the morning sun on the sea. This bedroom also has its own bathroom, a flatscreen TV, and a plush window seat for taking in the view. In-laws, nannies, and couples love the tucked-away guest house for its privacy and lovely views. 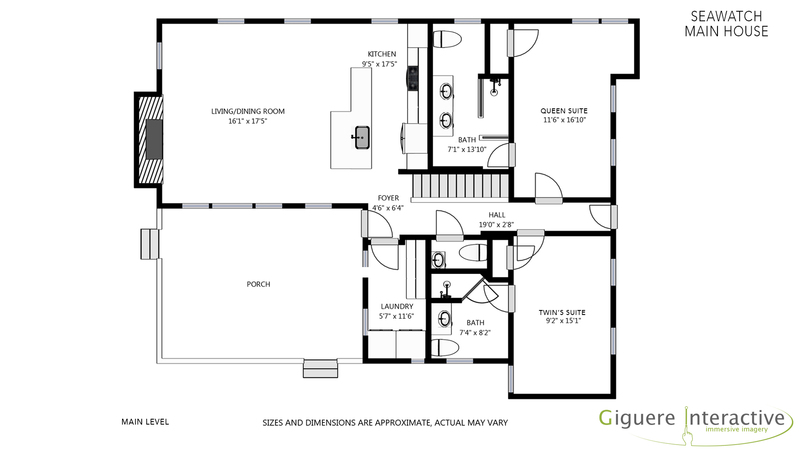 This entirely separate space includes a queen bed, a sitting area, and a full bath. Claim your perfect perch for an incredible oceanfront vacation at SeaWatch, where the Atlantic is never far from view and the beach is your backyard.